At a public meeting attended by nineteen people on 19th January 2011, the answer was definitely in the affirmative. At a follow up meeting on February 3rd a temporary committee was appointed and they met on March 16th to be officially appointed and to draw up the Till Valley Archaeological Society’s first constitution. The Till Valley catchment area would give us plenty of scope. Many members are from Scotland and recently the constitution has been altered to include the eastern part of the Scottish Borders. Some of the aims and objectives of the constitution are to promote the study of the archaeological heritage and history of the Till Valley, to acquire, develop and share the skills and techniques necessary for such research, to encourage the conservation of the archaeological heritage of the Till Valley and to communicate this knowledge to the public. With this in mind and with the consent of members, the committee lost no time in arranging talks and visits for 2011. In this we were helped by the willingness of speakers who found the time to assist us. Talks covered a wide variety of topics, some designed to help with research, others covering a range of mostly local history and archaeology, though we have been as far as Machu Picchu! They have included local and lesser known railways, drove roads, footpaths and rights of way, wagonways at the Neptune Yard, the Vikings in the North Atlantic, North East Whaling, excavations at Lanton Quarry, Low Hauxley and the Hirsel, the Romans in the Borders, conservation of buildings, the medieval fishing industry and many more. Over the past five years we have visited a variety of places such as Heaton, Copeland, Barmoor and Twizell Castles, Pallinsburn House, Berwick’s Edwardian walls, Newcastle’s city walls, the Ingram Valley, the architecture of Coldstream, digs at Fishwick, Barrowburn and Bamburgh and we have walked in the footsteps of Oswald – always in the company of an expert. Visits to the HER Office at Morpeth and the Berwick Archives proved to be helpful with our research. A New Year’s Day walk has become a popular annual event and is useful to blow away any Christmas and New Year excesses. At the same time the Society was under construction. We had a constitution, a committee of five people and Chris Burgess (Flodden 500 Archaeology Manager) agreed to be Honorary President. Linda Bankier, Jenny Vaughan, John Nolan and Richard Carlton became honorary members. The skills of committee members were ruthlessly rooted out and employed to develop various aspects of the Society! We have never lost an opportunity to promote TillVAS by means of the press, posters, our own excellent website and recently Facebook and Twitter. This is helping us to reach out into the community as do the several exhibitions of our work which we have held at local shows, in village halls and at events such as Bygone Borderlands. To facilitate this work we have obtained tables, display boards, a computer and, most recently, a projector usually with the help of grants. 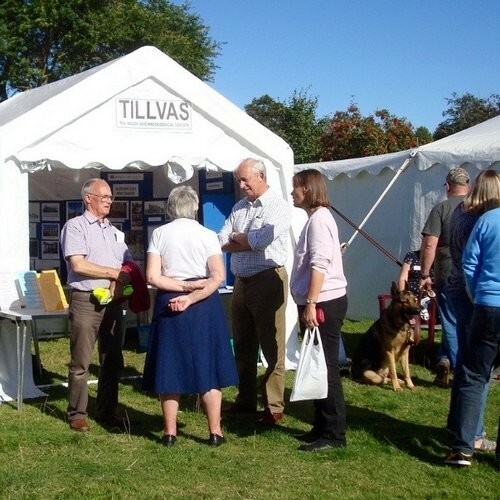 An essential part of raising our profile has been the colourful TillVAS leaflet aimed at encouraging new members, a logo, a monthly newsletter, membership cards and a splendid banner which is deployed wherever we go. A new chairman in 2014 gave TillVAS another interest – publishing. The connection with Flodden 500 is ever present. Members of TillVAS have metal detected, field walked, and excavated on the Battlefield throughout the project. We have followed this work by helping to wash and catalogue finds under the guidance of Jenny Vaughan and John Nolan. New shelving in the TillVAS store has helped with storage. Throughout we have learnt the relevant skills of metal detecting, excavation techniques, pottery identification and we have had the opportunity to acquire a variety of skills such as site photography, contexting, planning, profiling and recording of finds on excavations. We have taken advantage of classes to learn drawing skills and how to look at, and learn from, maps and aerial photographs. Soon after the inception of TillVAS, we began to look at the history of our area and we have gradually built up a very respectable archive. Berwick Archives, Woodhorn, local people and other sources have been of considerable help in this work and we have had the opportunity to learn and put to use various research techniques. In 2014 we obtained a Heritage Lottery Fund grant to do a Village Atlas of Branxton and Crookham. Work is taking place under the headings of Archaeology, Buildings, Social history and Oral history. Two apparently insignificant villages have so far produced a great deal of information and we have had documents and photographs from interested villagers. In 2015 test pits were dug in the two villages with the help of local people. We also welcomed help from the Young Archaeologists at this event. In 2013, TillVAS organised a James IV Memorial Lecture which has become an annual event. We chose a venue in Coldstream – across the Border. We were fortunate to have Richard Buckley, lead archaeologist on the excavation which found the remains of Richard III in Leicester and the event attracted 150 people. We also marked the anniversary of the Battle by planting a commemorative oak tree on the Battlefield. Chris Burgess planted the tree while a piper played the “Flowers of the Forest”. Chris Butterworth, chair of Coquetdale Community Archaeology gave a speech whose theme was peace. The ceremony was attended by people from both sides of the Border, members and several local farmers. The event culminated in a buffet lunch at Branxton Village Hall. TillVAS has had a massive amount of help from many people and sources which we deeply appreciate. Over the years the variety of skills and the hard work of the committee with the active support of members has made TillVAS what it is today. It has to be said that without the interest and support of Chris Burgess, TillVAS would not exist.